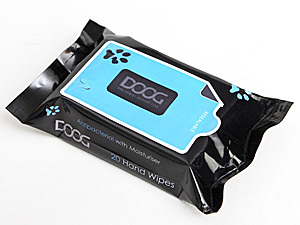 DOOG Hand Wipes are antibacterial Hand Wipes that help keep you clean and hygenic after picking up for your pooch. They even contain a moisturiser to keep your paws nice and soft. Each pack contains 20 hand wipes. The box of refills has 3 packs of 20, simply insert them into your Walkie Belt and pull them out like tissues (there's no need to open any pockets).